The journey of our freshly blanched Potato Chips continues towards their bag like homes, by their placement in the hopper of the dehydration machine. The machine uses centrifugal force to dehydrate the potato slices. The machine is made from stainless steel, which means it is easy to clean, sanitize and maintain. The video will give you an idea of how it all works. The machine pictured is obviously quite different to the one featured in the video, but that probably provides a better insight into what goes in within this more sturdy and robust machine. As the proportion of water and oil differs. The oil remains on the upper area of the machine and the water stays below. The residue from the frying process will disappear straight into the water, which will mean the oil will not smoke. This also increases oil's re-usability. This obviously creates a significant cost saving. The correct oil temperature will guarantee the best possible flavor and taste of the product being fried. When the frying process is complete the water will be released. At the same time the waste residue from the cooking process will flow out with the water. The machine below includes the frying part of a Chip’s journey, but we have included this particular video because it shows the full process featuring a full plant line of probably the next level up from the one we are detailing here. The machine pictured here is made of stainless steel, which means it is easy to clean, sanitize and maintain. The automation of this part of the process will of course save time and energy. This clever machine reduces the oil in the Chips by using centrifugal force via a fast rotating barrel to remove the excess. 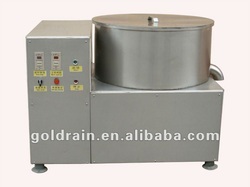 This also helps to reduce the oil consumption, not just of the Potato Chips and Crisps, but for the manufacturer. In turn, this improves the color and quality of the product. The video is of a slightly more basic machine, which will give you an idea of how it works. The machine below is equipped with an anti-shock device, which allows for stable running and a high de-oiling rate. It is also equipped with an automatic digital control, electromagnetic brake and a frequency and speed controller. This makes the machine easy to control the speed of the rotating basket and to operate. The machine is also equipped with a spill tank and an observation window. 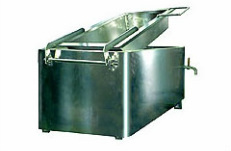 The machine pictured is made of stainless steel, which means it is easy to clean, sanitize and maintain.